In what has become a depressingly persistent undercurrent to the ongoing Brexit negotiation trainwreck, it appears that UK Prime Minister Theresa May and her European counterparts, led by chief negotiator Michel Barnier, have once again set themselves up for failure. As both sides scramble to produce the framework for a "backstop" transition agreement, a process that has been fraught with seemingly intractable conflict despite the fact that it would be explicitly nonbinding, it's looking increasingly likely that the UK and EU will miss another self-imposed deadline on Monday, as Bloomberg reports. Investors had hoped that the backstop agreement, or at least a rough outline of a backstop agreement, would be finalized by Monday, allowing both sides more time to figure out what the economic relationship between the EU and UK will actually look like after the transition has begun. The sticking point for May is the fact that the absence of a clear Parliamentary majority for the conservatives has put her in the uncomfortable position of trying to cater to a plurality of groups with different, sometimes opposing, demands, both in her own government and among the EU. In a piece published on its 'Brexit Blog' late last week, ING explained that the two most controversial aspects of any potential transition agreement involve what has been called the Irish border issue, and exactly how vague the wording on future trade should be. Then there is the 'wording' on future trade that would include a "temporary customs arrangement." Still, EU leaders bluntly informed May during last months' Salzburg summit that her Chequers plan wouldn't work. Yet, the EU's push for a more vague 'political statement' might be accepted by hardline Brexit MPs, who also objected to Chequers...the whole situation is effectively one giant gordian knot of a problem. What's worse for May, early Sunday in London, the Brexiteer hardliners published an open letter signed by 63 Conservative MPs, including David Davis, the former Brexit secretary, Jacob Rees-Mogg, the chairman of the European Research Group of Eurosceptic backbenchers and former Brexit minister Steve Baker, the former Brexit minister. At the same time, Anne-Marie Trevelyan, a pro-leave MP, published an editorial in the Sunday Telegraph demanding that any possibility that the UK could remain in a "temporary customs arrangement" after the Brexit transition period ends in December 2020 be stricken from the final agreement - because leaving open the possibility would be tantamount to ignoring the political will of the 17.4 million Britons who voted for Brexit. Meanwhile, Davis demanded in an editorial in the Sunday Times that Cabinet ministers should "exert their collective authority" and rebel against Theresa May's proposed Brexit deal. All of this is happening amid even more conflicting reports, citing sources from the EU and sources from No. 10 Downing Street, affirming and denying that a deal had been reached. Underscoring the hostility to a deal, the leader of Northern Ireland's Democratic Unionist Party said Sunday that she would prefer a "no deal" Brexit to a "backstop" transition agreement that would require any borders between Northern Ireland and the UK, arguing that this would amount to the "annexation" of Northern Ireland by the EU, per CNBC. 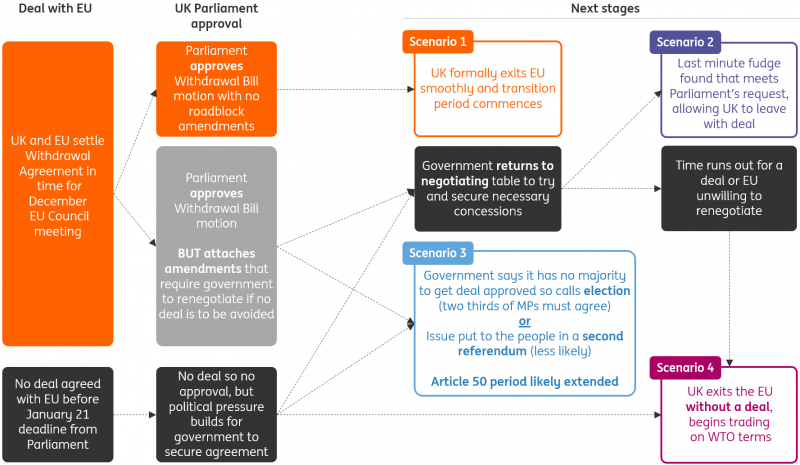 While much work clearly remains ahead - and the eventuality that Parliament could at the last minute sink whatever backstop deal is "finalized" between May and the EU remains a very real possibility - analysts from ING still believe the backstop agreement will be reached. While that likely won't happen this week, ING said, an agreement could be reached by an upcoming summit in November, with a Parliamentary vote taking place in December. 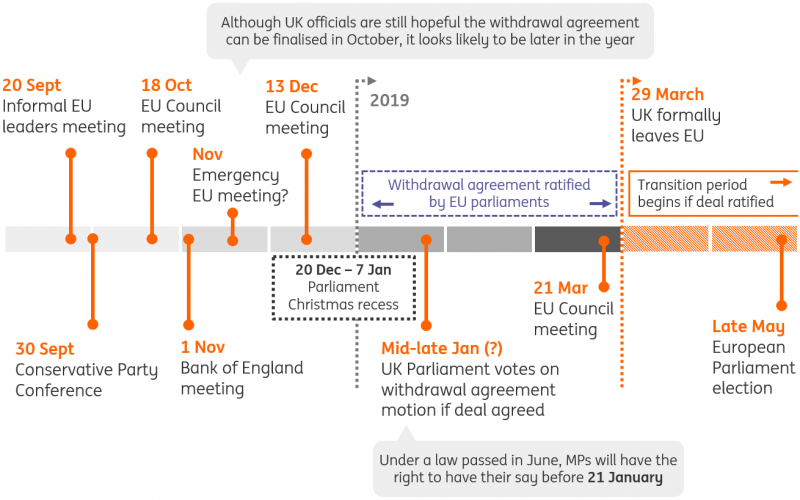 As a reminder, here's a timeline of important Brexit-related events, and an outline of four possible post-Brexit Day scenarios. Still, after pricing in the backstop deal's success in recent weeks, traders might not feel comfortable with the two sides blowing a deadline set for this coming week, as it could cause some to question whether Barnier was being unrealistically optimistic in September when he predicted that a deal would be reached by the end of this month because so far, negotiators have failed to prove to the market that they can square the circle and create an agreement that is palatable both to the EU and to the many opposing factions in the UK's Parliament.